A worker at S. Bravo Systems in Commerce sprays fiberglass onto one of the containment systems that will be used to collect leaks and spills from gas station pumps. Paola Bravo with her father, Sergio, who started S. Bravo Systems which builds containment systems for fuel spills and leaks around gas station pumps. Ductwork is part of the regenerative thermal oxidizer system installed by S. Bravo Systems to reduce its energy use and emissions. This duct work is part of the regenerative thermal oxider, which burns off the fumes created during the fiberglass-spraying process at S. Bravo Systems in Commerce. Commerce-based S. Bravo Systems cut its electrical bill while expanding its facility with SCE’s incentives for energy-efficiency projects. There was a time when Paola Bravo dreaded opening the electric bill for her small manufacturing plant. “The electric bill was brutal,” recalled Bravo, president and co-owner of S. Bravo Systems, an Hispanic-owned company in Commerce. 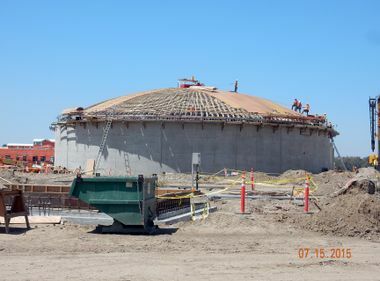 Even worse, Bravo’s company, which makes fiberglass underground containment systems that collect leaks and runoff from gas station pumps, had maxed out the plant’s manufacturing capacity and air quality emissions limits. To expand, Bravo would have to buy even more of the energy-intensive equipment that was running up her bill. But four years later, Bravo’s electric bill is no longer a major concern. 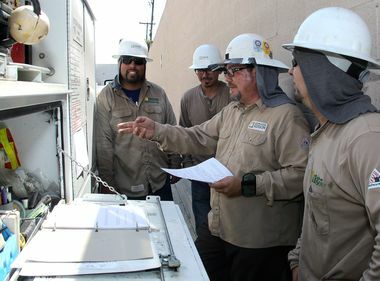 Southern California Edison worked with Bravo to expand her business by using energy-efficient equipment that not only lowered the electric bill, but reduced emissions and offered ongoing savings in the years to come. It was a happy outcome for the company that was built by Bravo’s father, Sergio, an immigrant from Chile. He began in 1969 with a service station maintenance business. In doing that work, he came up with the idea for the “Bravo Box” containment system to make gas stations safer while protecting the environment. Paola Bravo later took over operations of the company, but increasingly faced problems with the rising cost of electricity. Alerted to the issue, SCE account executive Brian Bustamante helped Bravo with a customized energy-efficiency program. The centerpiece of the program was installation of an energy-saving regenerative thermal oxidizer, which burns off the fumes from Bravo’s fiberglass spraying, casting and curing process and uses the most power during production. A variable frequency drive also was put on the main inlet blower. Bravo reaped two benefits from the work. The oxidizer burned off fumes from the fiberglass process, solving Bravo’s emissions problem. Meanwhile, the blower can work at variable frequencies, which saves energy by being able to ramp up and down depending on the size of the job. The company also installed LED lights, which can reduce a company’s energy use 50 percent to 90 percent over older lighting. Overall, Bravo reduced its electric usage by nearly 750,000 kilowatt-hours — enough to power 110 average California homes — and earned $82,000 in SCE incentive payments. “The energy-efficiency program will save the company $3.1 million over 20 years just in energy savings,” Bustamante said. Bravo also lowered its electric bill by enrolling in SCE’s Demand Response/Summer Advantage Incentive program in which a company agrees to reduce its energy usage when needed during peak demand to maintain the reliability of the power grid. In 2014, Bravo received $11,300 in critical peak pricing incentives and nearly $15,000 last year. Bravo, which SCE recognized with an Energy Efficiency Participation award, is not done with her energy savings. She wants to install solar power but said that will have to wait until she finishes buying new equipment to make Bravo even more efficient.